Prototype: German Federal Railroad (DB) class ET 87 electric powered rail car train. Consisting of a control car "a" (ES 87 03 a), powered car (ET 87 03) and a control car "b" (ES 87 03 b). Crimson paint scheme. The unit looks as it did around 1955. 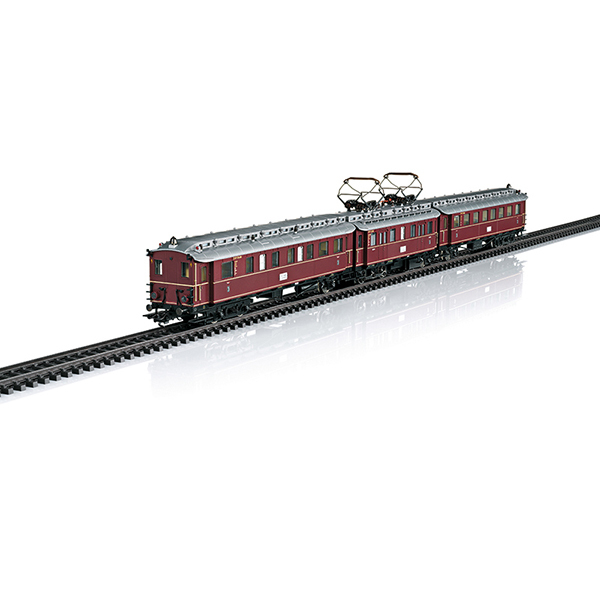 Model: The train has a digital decoder and extensive sound functions. It also has controlled high-efficiency propulsion and a powered center unit. 2 axles powered. Traction tires. Dual headlights and dual red marker lights change over with the direction of travel. The train has factory-installed interior lighting. The headlights / marker lights and the interior lighting can be controlled digitally and will work in conventional operation. Maintenance-free LEDs are used for the lighting. The passenger areas have interior details. There is an open view into the engineer's cabs in the end cars. There is a close-coupled special connection between the cars. The ends of the train have NEM coupler pockets. Length over the buffers 49.0 cm / 19-5/16".